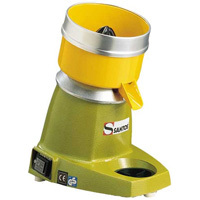 In the same way that that Champion 2000+ has ruled the roost in mastication juicing since the mid 50s, the Santos Classic citrus juicer has been one of the most popular centrifugal juicers since its creation by Santos in France over 50 years ago. This citrus juicer with its iconic design has been creating top quality juice in french bistros, cafes and restaurants for over half a century, so if you're looking for a juicer that's built to last and will help give your kitchen a cafe style ambience, look no further than the Santos Classic Juicer. You might have actually seen this juicer before. Cast you mind back to the last series of the Apprentice, and the contestants were sent around Marrakech looking to procure a list of items, and the Santos classic juicer was on the list. The design of the unit is tough and durable, with an aluminium alloy base an an unbreakable sanitary polycarbonate bowl. Usage is simple: just half your citrus fruit and press it into the reamer. You can expect 20 litres of juice from an hour's juicing. The Santos Classic is a fantastic juicer for the serious home juicer, or also commercial enterprises such as a hotel, cafe, etc. You can buy the Santos Classic Juicer from Nisbets.co.uk - the catering experts - and get next day delivery.